Have you ever tried to photograph a wolf on a wild terrain when it is sub-zero outside? 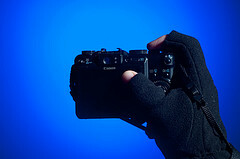 If you have, you must know that gloves are a photographer’s friend. Of course, gloves can be a nemesis as well, if they are making you clumsy and take away your ability to press them little camera buttons. I am going to show three ways to handle gloves clumsiness fever and then we will have a giveaway at the end. Why Is It Making You Clumsy? Have you ever tried zipping a fly with gloves on? Making a button on a blouse? Those are annoying, not to say impossible tasks when wearing gloves. Now, think about pressing all those little setting buttons on your camera. Changing ISO, shutter speed, chimping. Ain’t that easy with gloves on. Actually it is not the gloves that kill you it is the lack of fingertips. If you had your fingertips with you, everything would have been fine. Here are three options to get your fingertips back. Even more specifically it is the lack of your index and thumb tips that makes it so hard. This is probably the easiest way and the most expensive one. If you’re not into DIY homeless chick, this is a good alternative for you. 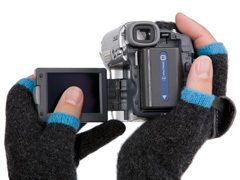 Etre Touchy has just the cool gloves that will keep you warm while leaving your finger tips free to touch the iPod touch or push that little preview button. This is by far the more stylish way of the three, and they are made knitted which is a big plus. Etre also has a cool combo between usability (on thumb and index finger) and coziness (on other three fingers). Etre are also doing a little fun giveaway with us, at the end of the post. I must say that knowing knitting is not one of my traits. I wish it was, but it is not. That said, if you know how to knit (or have one of those super cool knitting grannies) this is the second best as far as fashion and coziness go. 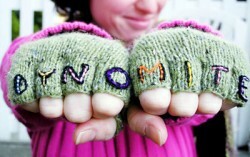 You can build upon many of the mittens or gloves patterns out there to create thumb and index tip free mittens. Or you can add fingers to a fingerless design like this one. OK, this may sound simple, but it is genius. If you did not win the giveaway, and don’t know how to knit, you can simply cut the thumb and index tips from a glove. It won’t be as cool as option 1; it won’t be as crafty as option 2, but it will keep your hands warm and your fingers available to push them buttons. It will also provide you with that much desired tough street look. If you go this way, make sure you do this with fleece gloves. I got a pair of those for about $7. Trying this with wool gloves will reward you with a long thread of yarn. Etre were kind enough to provide DIYP readers with 3 pairs of oh-so-cool pairs of gloves as part of a giveaway. Winner will get to choose size and color. All you have to do is leave a comment on this page (with a valid mail). 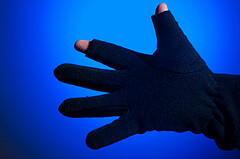 Comes Saturday we will give three pairs of Etre Touchy gloves to randomly selected commenters. UPDATE: The giveaway is now closed. Thanks for everyone who put ina comment. See the results here. If you can’t wait till then, you can get the gloves here.